Today I am giving a big "ha woooo" to Husky Electric of Minneapolis/St. Paul, Minnesota. Electricity is a good thing. Without it, I would have difficulty posting my blog each day. I am definitely pro-electricity. Their website states that "Husky Electric has quickly earned the reputation of 'Getting the job done right the first time' and the company to go back to for any electrical service." 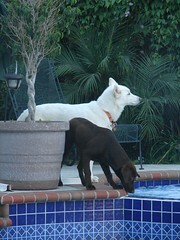 I would like to think that you can always trust a husky to get the job done right the first time. Wooo! Very cool logo! And electricity is good! When we lost ours during the ice storm, we had some VERY grumpy bipeds! WOoo! This logo is pawsome! And we too, LOVE electricity! From my human vantage point, it strikes that the one kink in this slogan is that you huskies and we humans don't always agree about which "job" is getting done the first time. Oh HOW COOL! 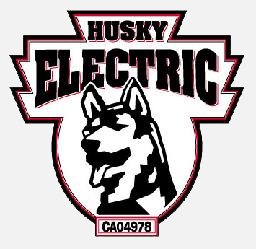 Husky Electric. My dad works for our Electric company here in So. Cali, I will tell him he needs to transfer!!! But how khan one get the job done right if they are in their khrate? I asked Mom if we Bedlingtons had anything cool like your Husky Electric Company and she said in England we have a town named after us (or the other way around) and a soccer team! I wonder if they need a team mascot?